We live on a hillside so all roads into our village go either up or downhill. In the header image above, the road drops down into the village from the north. The south side of our valley is just visible through the blue haze of Summer. We sometimes walk up the hill here to see the panoramic views of our valley and further afield. On a clear day you can truly see for miles from this road – north to the hills on the borders of Scotland (over 50 miles away) and south over our valley and the North Pennine moors. 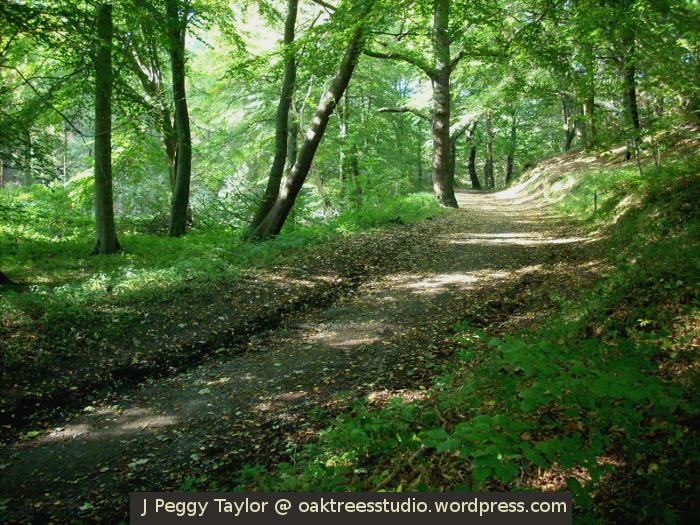 The old Stoney Road was one of the ‘main’ roads into our village a hundred years ago, wending its way through the woods. This road crosses over one of the old railway bridges I showed you in last week’s post (look for the bridge covered in snow). You can see the parapets of the bridge in the distance of this picture. It is to preserve the old bridge that this road has been declassified and is no longer used as a road for vehicles. 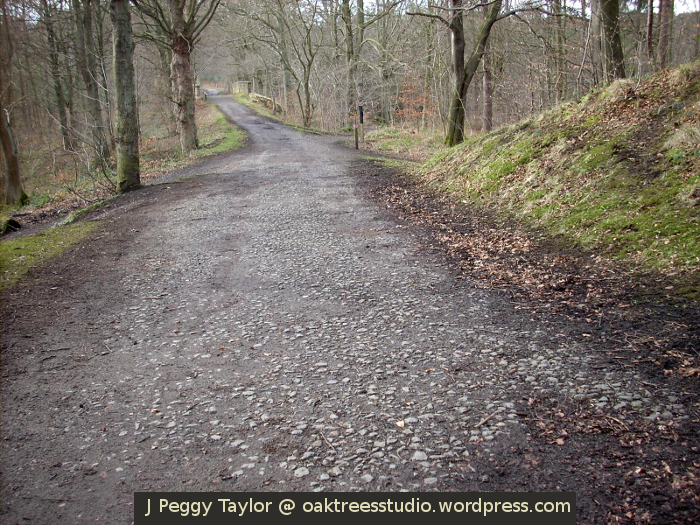 I think the Stoney Road has been resurfaced with new stones a few times, as parts of this road are subject to frequent erosion from rainwater run-off. My final road for Cee’s Fun Foto Challenge this week was taken with this challenge in mind, whilst we were out and about this week. We had been to visit an 18th century windmill, then our return coastal walk brought us to Souter Lighthouse which you can see in this picture. Souter Lighthouse was built in 1871 and was the first purpose-built lighthouse to be powered by electricity. Roads are such a significant part of our landscape. Most of us rely on them every day to enable us to access the places we want to go. 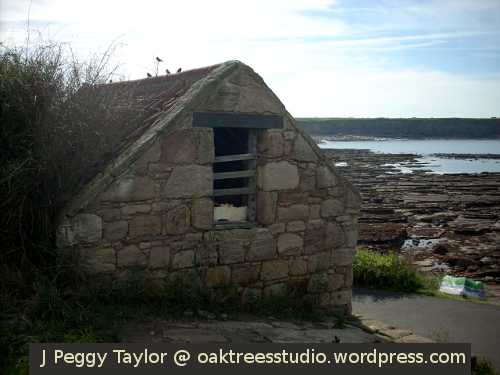 We had been to see some local history exhibitions before we went off on our coastal walk. 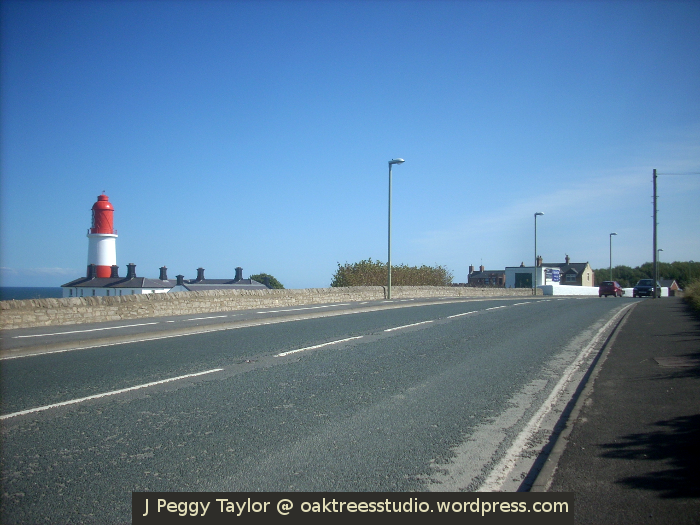 From images we saw, this well-used coast road looked much more like the old Stoney Road in the past too. It is interesting how some roads develop into modern transport routes and others become superseded and are left behind in the past. Sunday was one of the drier and sunnier days we have experienced in the past couple of weeks so I took the opportunity to go nettle gathering. 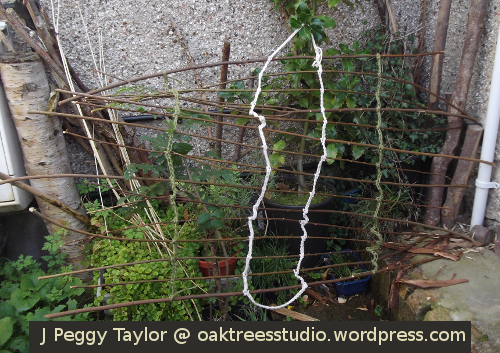 I am planning a new project using nettle fibre, or rather intending to create something of a cross between cordage and yarn. I did a little experimenting with nettle fibre last Summer and I’ve been keen ever since to develop this idea further – hence my need for nettles. The plants I wanted are the longest, thickest Stinging Nettles I could find, which may sound like madness but I have learned that the fibres in the taller nettles are likely to be stronger so would be best for yarn-making. I had spotted a ‘nice’ patch of suitable nettles when we’d been blackberry and apple picking recently, so off I set with gloves and my secateurs … and of course my specially designed lightweight trug created just for this purpose. Although it was a lovely warm sunny day, it was remarkably quiet along my chosen ‘nettle’ path and since it was so pleasant in the sun, I decided to defoliate the nettle stems right there rather than taking them all home first. Another part of the process I carried out straight away was removing the stinging hairs from the stems. With a pair of thick gardening gloves this is an easy operation as the hairs can simply be rubbed off by pulling each stem through gloved hands. The nettle fibres grow in the outer skin or ‘bark’ layer of the stem so I only needed the stems and this meant less to carry home in my trug too. To obtain the nettle fibre I need to strip the ‘bark’ layer off the stems. This process is called decortication. For the method I am using, I begin by splitting the stems lengthwise. 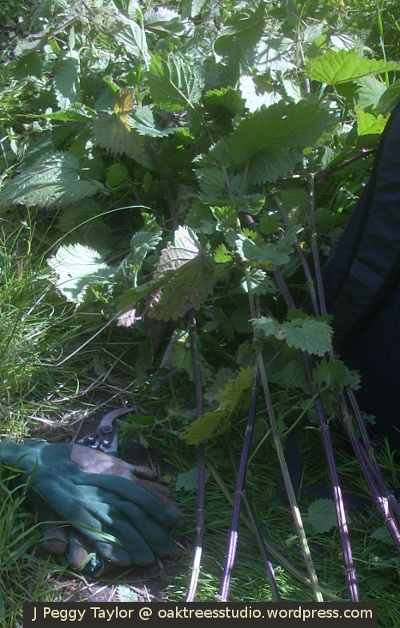 Whilst the nettle stems are still green, stem-splitting is as simple as standing on the stems to crack and flatten them. Now I will leave them for a few weeks to let the stems dry out before I attempt the next stage of the process. Clues to an industrial history criss-cross our now-green-and-peaceful landscape in the form of old railways and waggonways. These old transport tracks now serve as walking and cycling trails by which we are able to explore a significant amount of the north east region and also further afield. Throughout much of the nineteeth century railways and waggonways abounded in our region, particularly to enable the transportation of coal. Many bridges were built either to carry the tracks across the steep-sided streams that are a major feature of our valley, or to allow established roadways to cross the newly-built railways. Some of these bridges were lost during the later decades of last century when rural railways were abandoned on a huge scale here in the UK, but fortunately many bridges survived and now form historical features of the walking and cycling trails. Thinking about black and white for Cee’s Fun Foto Challenge this week led me to remember and seek out images of some of these bridges I had collected a few years ago for another project. 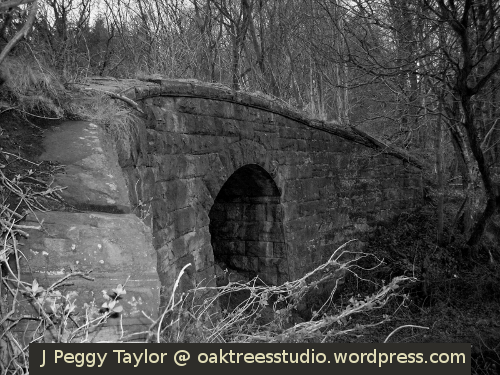 The bridge in this first image carries the old road over what was the mineral railway line that carried coal from our village ‘pits’ down to the River Tyne. We often walk this way so we have seen it in all weathers. 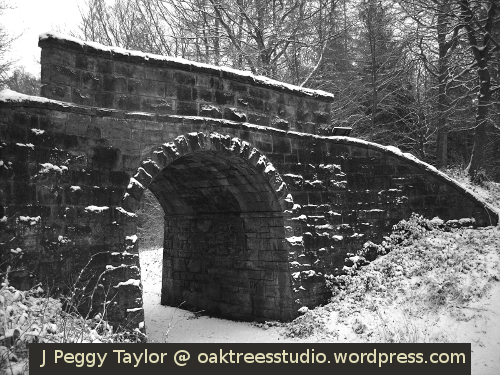 I think the snow seems to add something to the ‘by-gone era’ feeling of this Victorian stone-built bridge. Only a short distance away on this same old railway there is another stone bridge, built in a similar style to the first. This one carried the single-track railway over a farm track that provided access to the fields and woods beyond. Now the bridge arch is largely filled with earth underneath, as on this stretch the old railway forms the boundary to a golf course. Unlike the first bridge which stands as a well-known landmark and proud historical reminder, this one is almost hidden away and overgrown. It’s not a railway bridge, I know, but it is a nineteeth century construction and it was built to aid travelling, so I decided to include it in this post. There are several of these arched stone-built or brick-built culverts dotted around our woods. 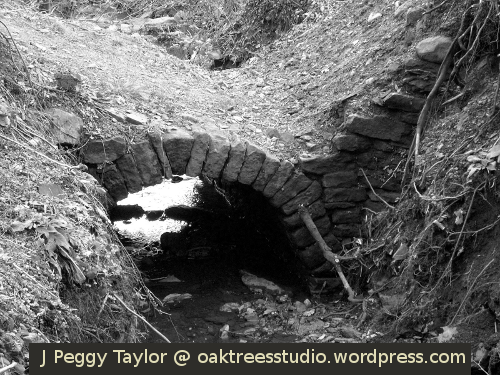 As with this one, the culverts were used to carry the streams underneath paths and tracks. Earth would have been embanked on top of the culvert to help level out the path as it passed over the steep-sided stream, making it easier to walk, ride a horse or transport goods by cart through this part of the wood. Another Victorian railway line and another Victorian bridge. 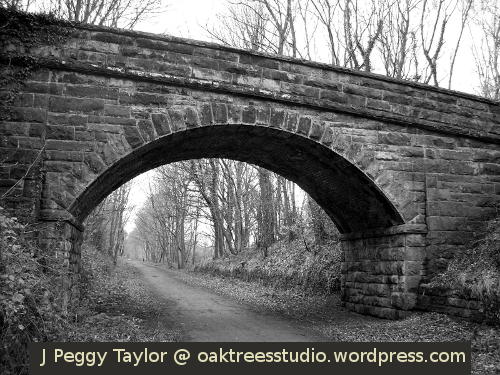 This lop-sided bridge still carries a farm road over the Derwent Walk Railway Path. No, it isn’t your eyes, or my dodgy photography [not this time!] … the bridge does slope downhill from left to right. 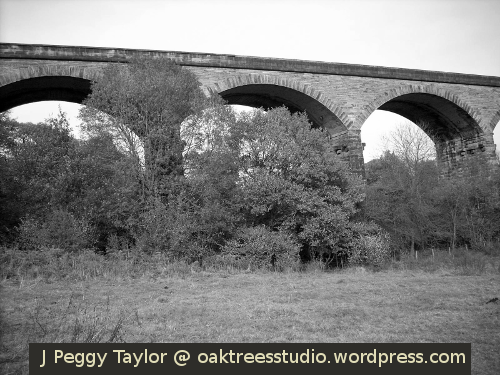 This railway through the picturesque Derwent Valley formed the Consett branch line of the North Eastern Railway. Opened in 1867, it was a busy railway linking Consett to Newcastle, carrying passengers and goods. There are no rails on this track any longer but it remains busy as part of the C2C route of the Sustrans National Cycle Network – the C2C literally crosses the UK from coast to coast, east to west … or west to east depending on which direction you choose to cycle! I’ve saved the biggest bridge until last! The Nine Arches Viaduct is one of those marvels of Victorian engineering at 500 feet long and rising 80 feet above the River Derwent. One of four viaducts along the Derwent Walk Railway Path, the impressive Nine Arches Viaduct only came to be built because the Earl of Strathmore refused to allow the railway to cross his land at Gibside on the south side of the valley. Looking underneath the arches of the viaduct, you can see where a ‘second’ bridge has been added to allow a second track to be laid along the route. There are some marvelous views to be had from this vantage point – perhaps I can show you another day. I think there is something immensely ethereal and primeval about sunlight in Winter. Here on latitude 55 degrees north, we experience our ‘shortest day’ of the year on 22 December. On that day the sun rises around 8.30am in the morning and sets around 4.00pm in the afternoon. Since it occurs during our normal waking hours in mid-Winter, we notice and often watch the sun as it rises or sets in spectacular fashion. The above image was taken in mid-January at 8.30am. 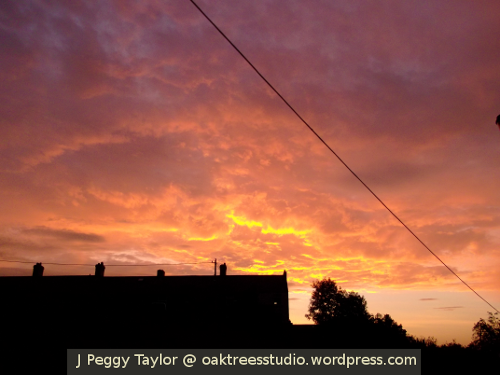 As the sun rose over the woods to the east of us, the sky filled with flaming colour, silhouetting the trees and the valley horizon … and our washing line and the streetlight. Even these mundane details were drawn into this dramatic, glowing dawn. It is not at all surprising to me that our ancient ancestors were such keen observers of the ‘movements’ of the sun, nor that fire was of such significance to them, especially during those dark Winter days. A few miles across the moors from us, the town of Allendale hosts a unique fire festival on New Year’s Eve (31st December) called the Tar Barl, when flaming barrels of tar are carried through the town as part of the New Year festivities. In northern Europe fire festivals hark back into ancient times when encouraging the return of the sun after the dark days of Winter was an important task. Browsing through our photo archives for silhouette images for the WordPress Daily Post Weekly Photo Challenge this week, I noticed the images that best fitted the theme also had something else in common – Winter sun. 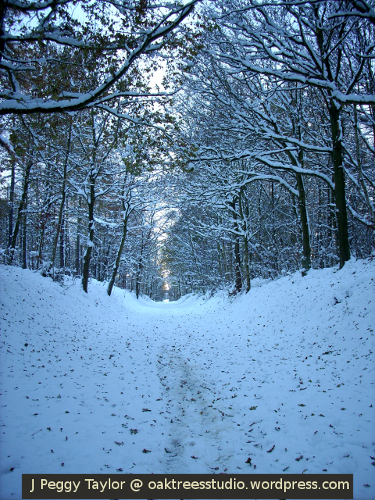 The old railway cutting is one of our regular paths so we have seen it in all weathers, as we make our way in and out of the woods. 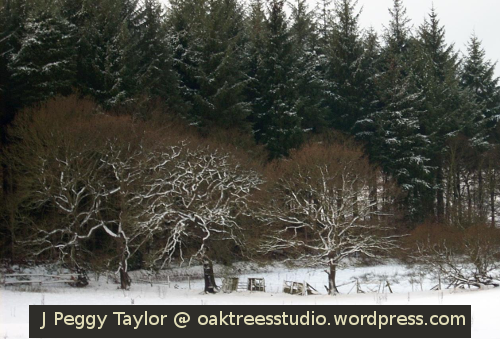 I love the way the snow lights up the cutting, emphasising the dark tree trunks on each side. The pale peach light of the setting sun is just visible directly ahead. When we see that pale peach light, we know we may be treated to a beautiful Winter sunset as our path takes us onwards out of the trees. 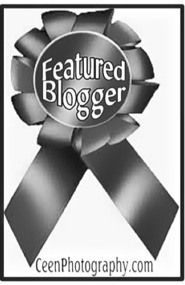 I showed another image of this location in my last post for Cee’s Fun Foto Challenge Winter theme. 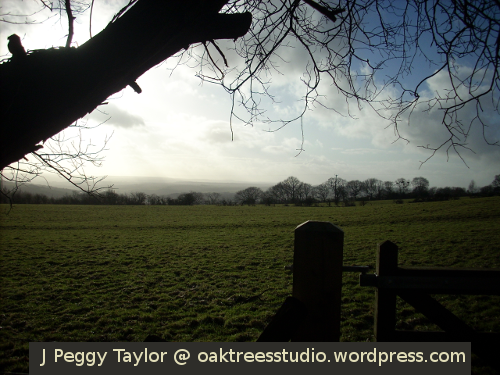 Here on the edge of the wood we can look out right across the upper valley and moors. Beyond the drama of the dark foreground silhouettes of the tree and the gatepost, I also like the middle distance silhouettes of the Winter trees. Their leafless branches expose the stark beauty of their structure, like natural sculptures. In Winter the sun sets behind the distant valley here, so this is a favourite view of ours. This is another one of those slightly strange Winter sun experiences. My son spotted this silhouetted tree pattern against the sun as it struggled to put in an appearance through the cold and heavy grey sky. The substance we know as ‘water’ is a crucial part of life here on Planet Earth. Water truly is a ‘strong generative force’ and it plays such a significant part in the cycle of the seasons. Thinking about the seasons always leads me to think about the natural world and its continual battle for life. In browsing through my archives to choose images for my challenge entry this week I was very much reminded of the hardships nature must endure just to survive, especially during the cold season of Winter. I was also struck by how different our ‘normal’ environments can appear when wrapped in Winter snow. This group of oak trees stood out against the dark green pines beyond. I noticed the way the snow had clothed the main branches of the trees. It looked as if the branches had been painted white. The thinner oak twigs retained their red-brown colour and contrasted with both the oaks’ snow-white branches and the darkness of the tall pines. We often walk by this coppiced hazel. 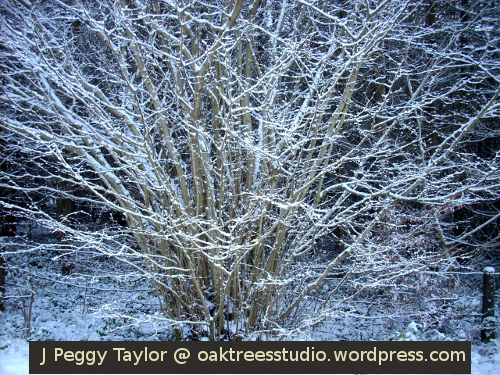 As with the oaks above, the snow has clung to the leafless twigs and branches, giving it a decorated effect. I love the way the snow highlights the underlying shape of this tree. 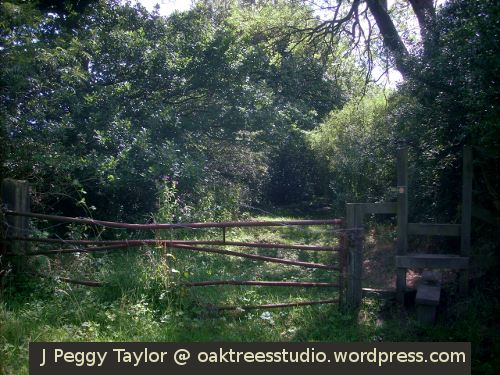 There is a convenient bench just by this gate, on which woodland visitors may linger and look out across the valley. As you can see, this was not a day for sitting or indeed for lingering too long either. 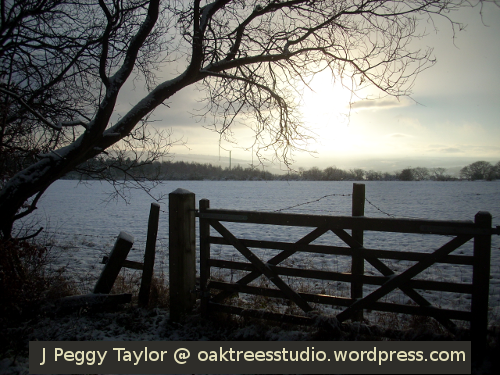 It was very cold, but the slowly setting Winter sun gleamed so beautifully across the snow-covered fields. This was the first of many snowfalls that Winter. The snow fell so thickly and so quickly. 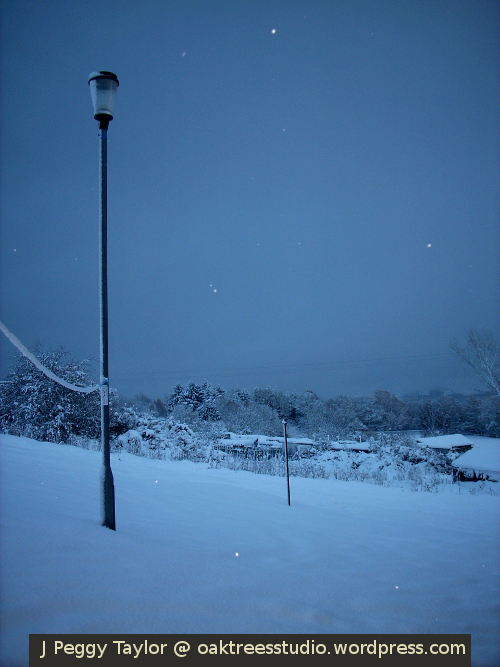 I took this photograph from our front door at around 4.30pm, during a brief interlude when the snow eased off a little. 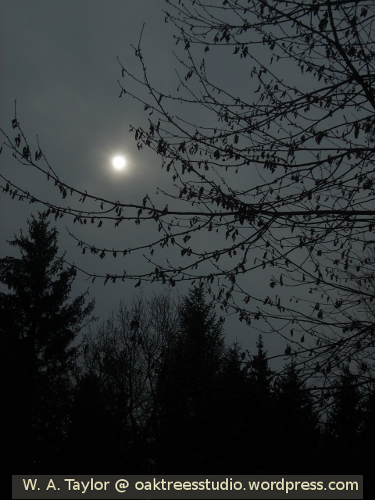 There was this eerie blue-grey light as we looked out eastwards towards the woods. It is very unusual for us to have snow on this scale even before November is out. Hopefully our Winter this year will not be too harsh. Having fresh herbs to hand makes home cooking even tastier. During the warmer months of the year I like to make sure I’ve got some of my Summer-grown herbs stashed away ready for use in the colder months too. 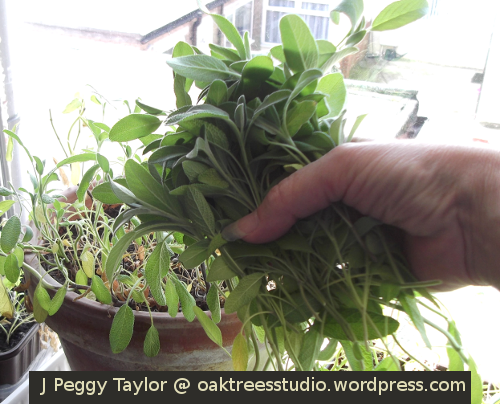 A little while ago I was telling you about the various herbs I am growing and preserving this year. 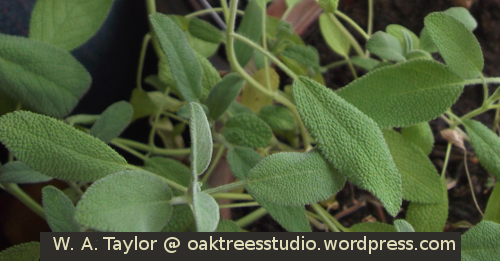 One of the herbs I grew from seed this Spring was the wonderfully aromatic Sage. I cut my first batch of Sage 6 weeks ago on 24th June and hung it up to dry. Now this week I when I checked its progress I decided it was dried enough and ready to ‘rub’. 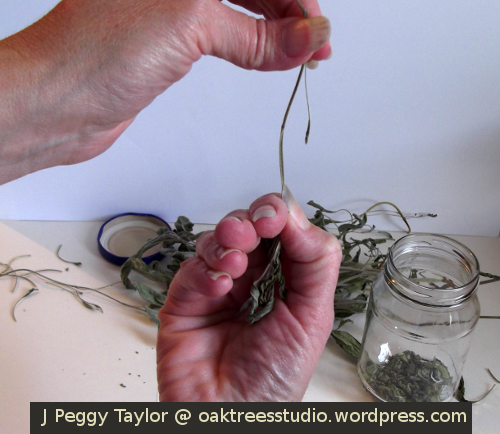 Rubbing Sage is simply breaking up the dried leaves with your fingertips so that the herb can easily be stored in a jar ready for use. You can rub Sage onto a plate or other surface but as I only had a small batch to rub I attempted to rub it straight into the jar … most of it went in, as you can see, with only a little escaping onto the clean cardboard beneath. 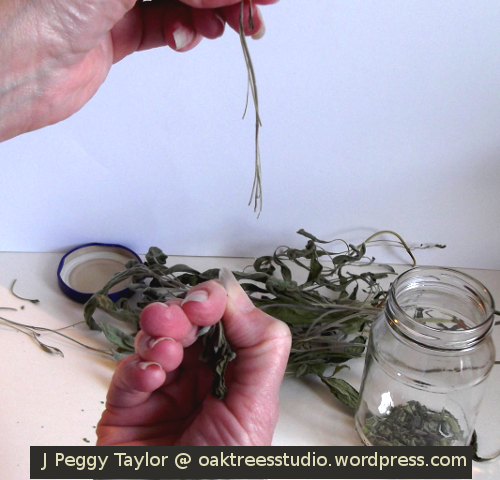 First I removed the Sage leaves from their stem. To do this, hold the base of the stem in one hand and point the leaves downwards. With your other hand, pinch the stem firmly near its base between your thumb and first finger. Then draw your ‘pinch’ downwards, pulling the leaves from the stem as you move towards the top of the stem. Now we are ready to rub the Sage leaves. It’s best to lay the leaves down and work with just a few at at time. Hold the leaves between your thumbs and fingertips and literally rub the leaves. If they are dry enough they should break fairly easily, though some may need a little tug to tear them apart. 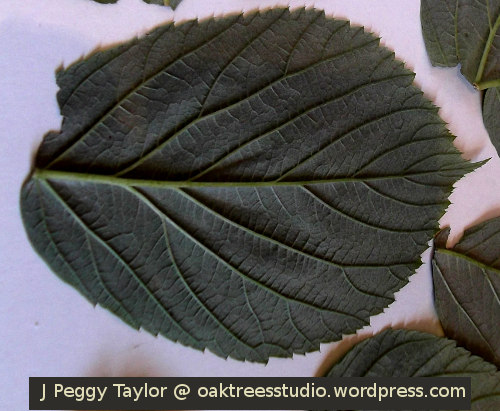 Sage leaves don’t take much processing as we are aiming for small pieces of leaf rather than dust! 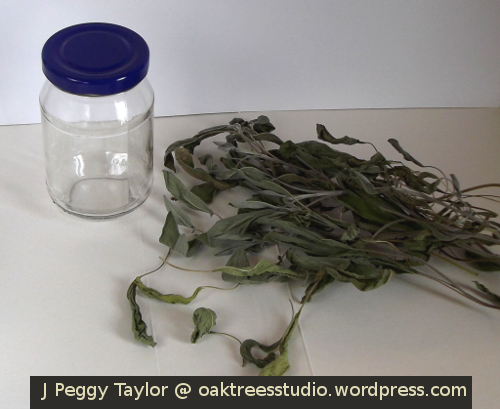 When all of the leaves have been rubbed they can be stored in an air-tight jar. 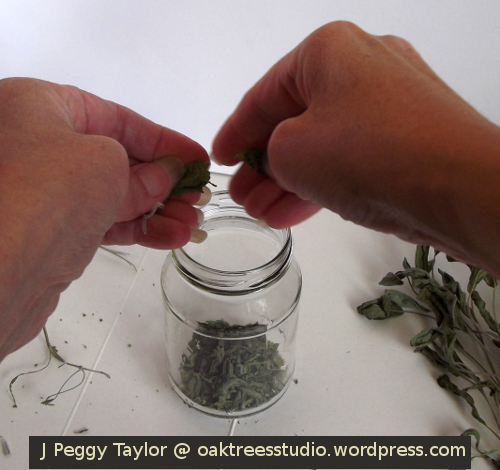 I love not only the smell of Sage but the texture of the leaves too, so rubbing the Sage allows me to enjoy both! I think the way the veins grow in the Sage leaves give them such an interesting mosaic texture. My Sage plants have also now grown on enough to allow me to cut a second batch today and hang them up in their brown paper packet for drying. This second batch is more substantial than the first. This is because when I cut the Sage I left about one third of the stem on each plant. All of the stems I had left have now re-sprouted strongly. Again I have left a little of each stem to enable the Sage to regrow. Maybe I will be able to take a third batch for drying before the plants slow down their growth when the weather begins to grow colder and there’s less sunshine – I shall have to wait and see. Natural textures don’t only reveal themselves to us through our eyes, I find. Sometimes they appeal to our sense of touch instead. 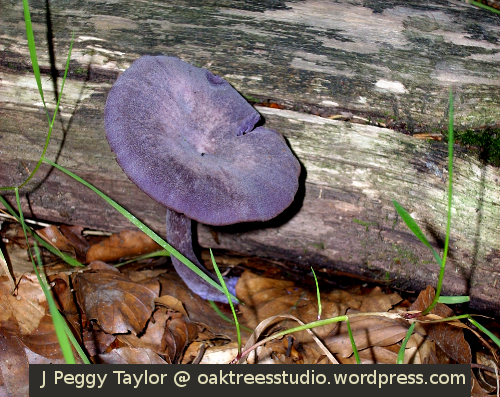 An example of this for me is when I notice something new in the texture of tree bark. To really appreciate its beauty, I am drawn to touch it, to experience the tactile nature of the texture. This week I have been working with what I call ‘real’ wool in a crochet project. This hand processed and handspun natural undyed wool is from the fleece of Jacob sheep. This wool yarn has a wonderful springy texture which is retained in the crocheted fabric as I work. 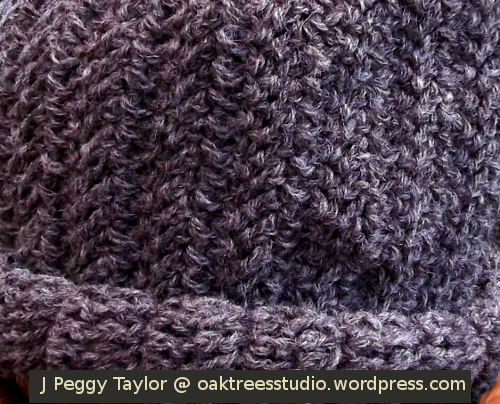 In this particular project I am introducing a further texture in the form of a herringbone stitch pattern. The herringbone design dates a long way back into antiquity and I felt this ancient design seemed appropriate for this ruggedly natural wool yarn. My second natural texture came as part of my recent experiments with natural ingredients for ‘tea’ type drinks. This week this led me to try out raspberry leaves. For me, natural ingredients are more likely to be found in the woods and hedgerows than in supermarkets. For raspberry leaves, I knew just where to look. Picking raspberry leaves whilst balancing on the edge of a ditch makes you acutely aware of all your senses, it seems. As I stretched out carefully to reach some unblemished leaves, I was intensely aware of how soft and velvety raspberry leaves are on their dark green upper side whilst their pale, grey-green undersides are traced with prominent veins, plus one or two small thorns. Following a refreshing raspberry leaf tea taste test using a single fresh leaf, I am currently drying the remainder of my foraged leaves for future use. Sometimes when searching through your photo archives for a particular shot you need for a project, you come across images you love but had almost forgotten. 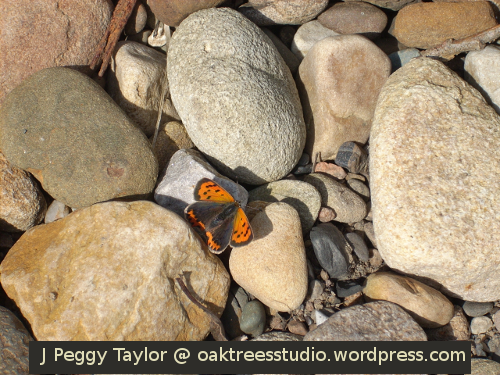 This shot of a Small Copper butterfly resting on the sun-warmed riverside shingle is one such image for me. I love the delicate softness of the butterfly against the stones. The stones themselves provide a wonderful variety of textures – from rough to smooth. Hiding away towards the top left of the picture I noticed a piece of rusty metal too. 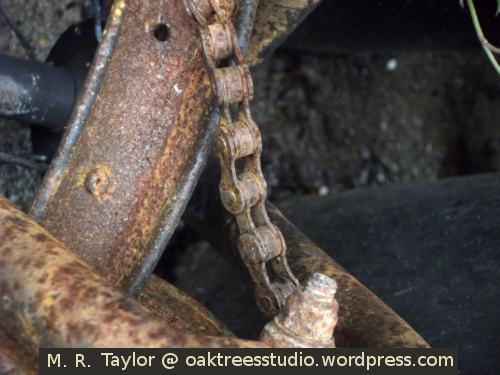 I have enjoyed exploring the creativity of texture for this week’s WordPress Weekly Photo Challenge. 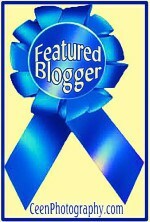 I am always inspired when visiting other blogs to see how people have interpreted the challenge. Each of the seasons has its own special attractions and things to look forward to. They also have their own set of colours. Autumn certainly doesn’t do colour in half measures in our area. As well as the science magic of anthocyanin as it paints the Autumn leaves red, there are some other colour highlights we watch out for during this season. This is one of the things I always look forward to in Autumn – amazing sunrises and sunsets. This photograph was taken from our front door just after dawn. 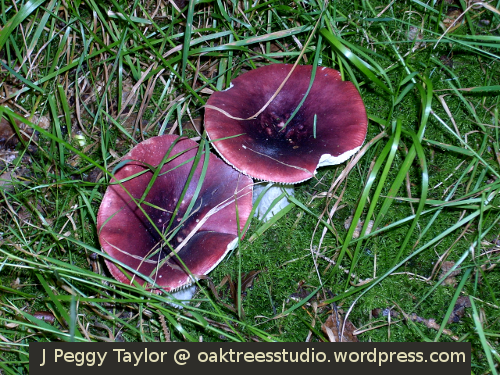 Fungi are another source of Autumn colour we like to seek out on our woodland walks. 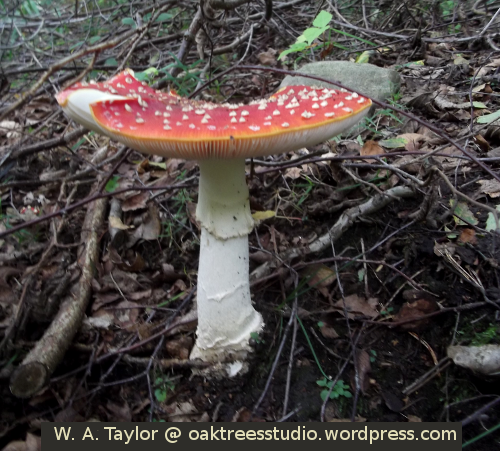 Fly Agaric Amanita muscaria provides one of the classic ‘toadstool’ images, with its bright red cap dotted with white spots. The ‘spots’ are not strictly part of the cap, but are really remnants of the white veil that covers the fungus as it grows. 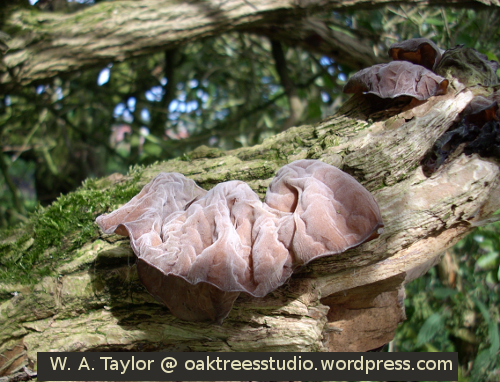 This Jelly Ear fungus looks rather brain-like in my son’s photo! 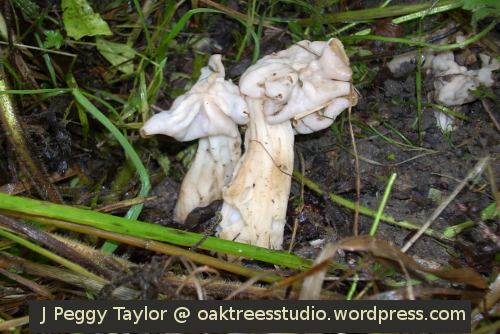 I think the White Helvella fungus looks like it has been fashioned out of molten wax. To complete the ‘Metal’ aspect of Cee’s challenge this week I have chosen one shot from our family archives and a new image I came across on a walk just this week. This rusty old child’s bike was retrieved from undergrowth by our sons, specifically for use as practice subject matter for photography! We seem to come across these kind of field gates on our walks … rusty and somewhat bent out of shape! Be sure to check out what others have chosen for Cee’s Fun Foto Challenge on the theme of Metal or the Season of Autumn this week. Collecting bundles of long-stemmed plants or flowers can be awkward, especially if you need to carry them any distance and don’t want to break the stems. If the plants in question are Stinging Nettles, then that makes collecting them even more difficult. I collect both nettles and Comfrey in Spring or early Summer as I use them to make plant food. I will also be collecting a quantity of nettles fairly soon for a fibre art project I’m working on. 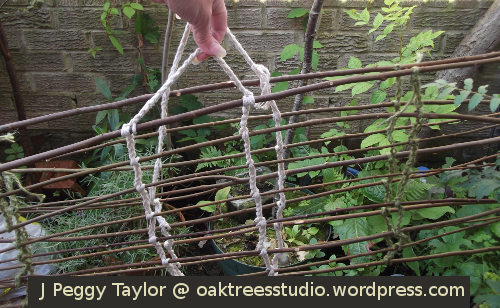 Thinking about the practicalities of these tasks this year led to me designing and constructing a basic, lightweight and readily portable trug suitable for my long-stemmed-plant-carrying activities. 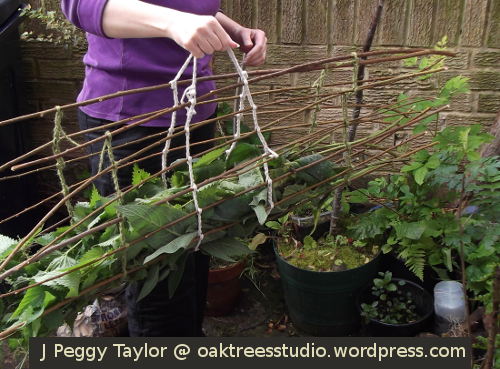 In recent months I’ve had a bit of a ‘thing’ about crafting in willow and jute, so I had some of these natural materials to hand with which to try out my trug-making. I thought I’d share this little project with you. The design I’ve created is very simple and could be made in other, or more sturdy materials, as suits the purpose of your trug. 1. 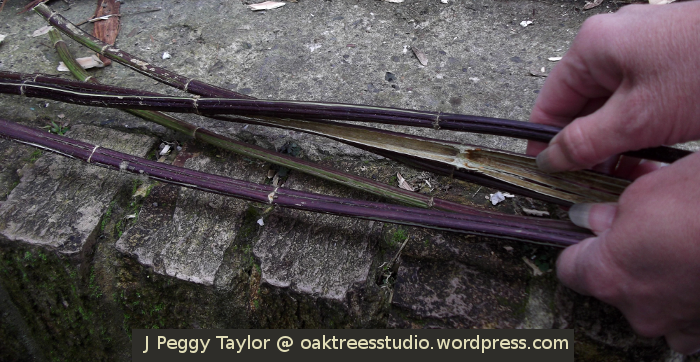 Firstly, I trimmed the thinner tips of the willow rods so that they were all about 1 metre (39 inches) long. 2. 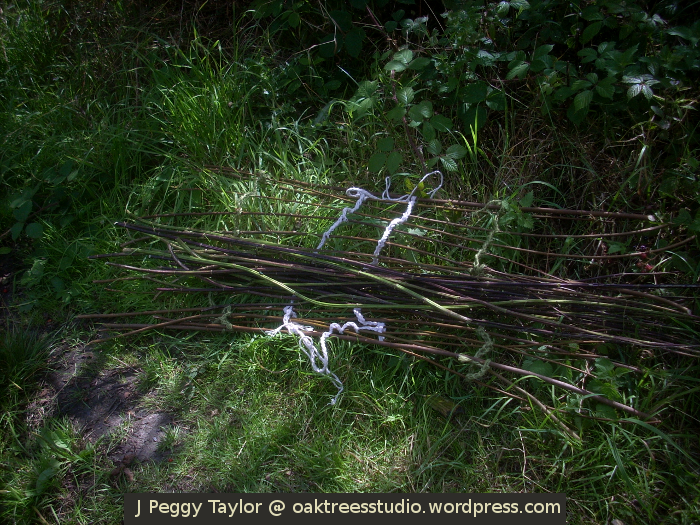 I arranged the willow rods, making sure they were all parallel with each other and about 5cm (2 inches) apart. 3. Using the cotton string and the crochet hook, I carefully crocheted across the willow rods 7.5cm (3 inches) to the right of the centre of the rod, making sure I kept the rods the same distance from each other, working 6 crochet chains between willow rods and keeping the rods parallel lengthways too. To secure each rod I crocheted around it with one chain in each direction, before continuing with my crochet chain across to the next rod. 4. 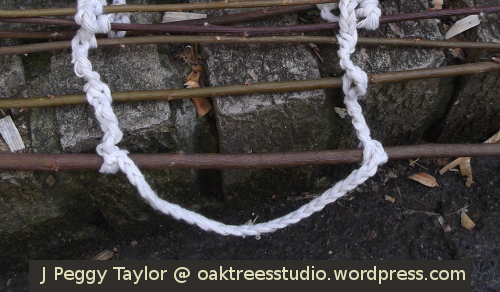 When I’d crocheted right across all of the 15 willow rods, I created a carrying handle 20cm (8 inches) long. With my thick cotton string I worked 21 crochet chains for the handle. A closer view of one of the trug handles. 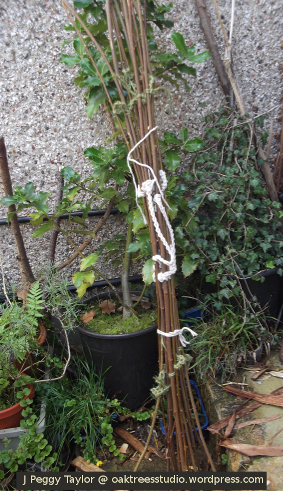 You can also see more clearly how I have crocheted around the willow rods. 5. Next I crocheted back across the willow rods, 15cm (6 inches) away from first row, (that’s 7.5cm / 3 inches to the left of the centre of the rods) again keeping the rods the same distance from each other by working 6 crochet chains between the rods. 6. When I’d completed this second row of crochet, I created the second carrying handle on the opposite edge of the trug, in the same way as the first handle. 7. I carefully secured the end of the string to ensure the handle stays firmly attached. 8. To complete the trug I worked a second row of crochet on each side. I placed these outer rows of crochet 18cm (7 inches) from the first and, this time, I worked my crochet in green jute garden string. Again I fastened off the yarn securely. … and that was my trug completed. I have used it a couple of times so far for carrying Comfrey and Stinging Nettles and I found it worked just as I’d hoped for my needs. To roll it up, I simply hold the handles and gather together the willow rods then secure it by tying a piece of string around each end. 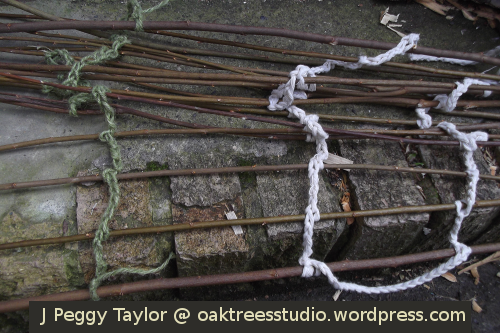 I am thinking of making a tougher one – ready for Autumn – using hazel rods. I will use it for carrying willow rods or other heavier woody materials.